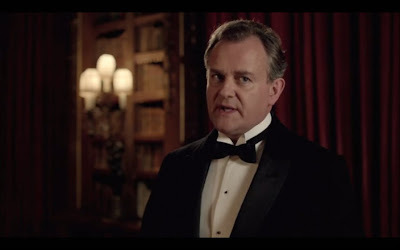 Top Five Lines from Downton Abbey, Season 3, Episode 5 or “Robert’s Horrible, Terrible, No Good, Very Bad Day"
Poor Robert. He was really having a bad night, wasn’t he? Seemed like he was facing opposition at every turn in this episode, not the least from his wife. So let’s start there, shall we? Robert and Cora. I have to say that their grief was very raw this episode, and, I think, very realistic. I felt their pain when Cora shut him out and when Robert tried over and over again to reach her. So, so difficult. You can just feel their sadness. 5. And so, I start with the exchange between Robert and his mother. It was a tender scene, wasn’t it? Robert confessing that things between him and his wife weren’t in the best place at the moment, and Violet adding her wisdom, compassion, and even a touch of humor to the situation. Robert: I can’t seem to think straight about any of it. Violet: My dearest boy, there is no test on earth greater than the one you’ve been put to. I do not speak much of the heart since it’s seldom helpful to do so, but I know well enough the pain when it is broken. Ah, Violet. This is why I love her so. While she can be snarky (as we shall soon see) and biting and condescending, she can also be deeply compassionate and loving to those around her. I just love the way they have developed her character, especially this season. 4. I have to say that I resonated with much of this episode, having lost a sibling of my own a long time ago. So much of what they said about grief rang true to me. Like, for instance, Violet’s words: Grief makes one so very tired. And then there was Cora’s poignant line: Is it over? When one loses a child, is it ever really over? I applaud the writers for getting much of this right. 3. I love, love, LOVED the interlude with Daisy and her father-in-law. How sweet are they? Did you see the big smile he had on his face when Daisy walked up to the farm? Adorable! But even before she left, there was the brief discussion in the kitchen. Alfred doesn’t get it, does he? He thinks that being a farmer, working for himself, would be so much easier than being in service. He talks about how great it would be to not have to answer to anyone. But Daisy puts him in his place. She totally gets it, and defends William’s dad in the process. Dad, that one’s for you. I think a certain dad of daughters around here may have tucked that one away for someday if necessary. 2. You know this one had to make my list. 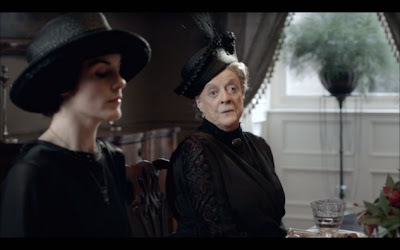 In the scene with Violet and Dr. Clarkson, she’s trying to persuade him to come clean with Cora and Robert about Sybil’s chances of survival. It’s important to Violet to get the two of them to move forward together, so she asks Dr. Clarkson to present the truth in as “helpful” a way as possible. Violet: “Lie” is so unmusical a word. 1. And finally, the scene that topped my list last night took place in Isobel’s dining room. Ethel, the former prostitute (gasp! ), was serving all of the ladies their luncheon. Robert’s horrible, terrible, no good, very bad day has reached its peak at this point, and he storms into the dining room just as Ethel has brought in the dessert. Robert comes across as the bigoted prude that he is, but is trying not to be, and Cora staunchly refuses to budge. (“Oh, is that a Charlotte Ruse? How delicious!”) Edith and Mary just sit there with their mouths open. Ethel just about drops the tray. Isobel stands in defiance. It seems a pity to miss such a good pudding. And the gauntlet has been thrown. Old vs. new. Tradition vs. progress. Law vs. grace. Seems like things are changing just a little too rapidly for poor Robert. What do you think? Will Robert be able to roll with the changes? Will the estate be saved? What was your favorite line of the week? Comments, please! I can't wait to see the scene between Robert and Matthew. Should be explosive. And in the scene where Mary & Matthew went in to hold baby Cybil did it seem like they were setting up for Thomas to leave her with them? Ooooh, Abbie, I didn't think about M&M keeping baby S. Hmmmm. Yes, I'm looking forward to seeing that confrontation too. They are going to have to put Robert in a cage somewhere to get things back in order! I HAD to, I mean got to watch the Super Bowl with the fam, so no Downton for me this week. Still read your great lines and look forward to catching up next week. Becky, I've got it here if you want to come over to watch it. I sure wouldn't mind seeing it again! You can also watch it at PBS.org. LOVE this post and so glad I can finally read Downton Abbey posts, because I caught up finally last night! We've watched 3 seasons in less than 3 weeks. Needless to say, I am so tired I can't see straight, ha! I have to re-watch from the beginning when it's over in order to soak up all these great quotes!! WHY do we love this show so?!! :) I told David that I seriously am crazy...I think about these fictional people during the day!!! Kidding...sort of. This post is a diamond! I loved this episode. And I love what you've written about it. You truly do have inside knowledge of what the Crawley sisters and their parents are going through. I agree with all of your thoughts. LOVED "Robert's Horrible, Terrible, no Good, Very Bad Day. Always loved that book as a kid. I can't wait for the next episode and am trying so hard not to find a way to watch them online from the episodes already aired overseas, because they it will be over and what will I do! Amanda, I know what you mean! Thinking and talking about those characters like they're real people--we do that too! And seriously, I think my girls and I will watch every season through at least once a year. It never gets old, does it?! I know what you'll do, Abbie, watch them all again! ha!